It’s little wonder, then, that Knightley has re-teamed with her P&P director Joe Wright twice since, first in the bloated Atonement and now the umpteenth adaptation of Anna Karenina. Their rendering of Leo Tolstoy’s classic novel is opulent and earnest, an eager production that’s more busy than bold. And while there’s much to admire about Wright’s aesthetic, you probably won’t remember what they were a half-hour later. In adapting Tolstoy’s tale of romance, (in)fidelity and society set in swinging 1870s St. Petersburg, Wright situates the action within the tableau of a stage production, albeit one with a broad conception of space. Scene transitions pass between pulleys curtains and lighting rigs; actors are situated in front of flood lights; some outdoor scenes are conceived with painterly landscapes. 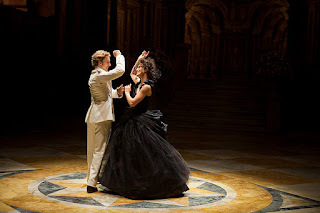 It’s a conceit that’s initially off-putting, but gradually the staging devices become an object for artistic admiration, such as a horse race that appears to run from stage right to left and an exquisite ballroom dance scene as Anna (Knightley) and her illicit lover Count Vronsky (Aaron Taylor-Johnson) twirl amongst a crowd of onlookers literally frozen in time. 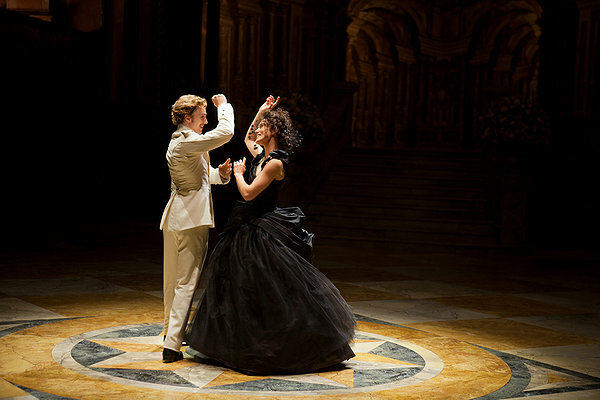 However, Anna Karenina is a story built on passion, which is something that frequently gets lost amongst the cinematic atmospherics. The literary Anna is a victim of cultural mores and desire so unbridled she allows it to compromise her marriage and social standing. While Wright and Knightley effectively convey that reckless abandon, what’s missing is any apprehension for its provenance. Anna simply swoons breathlessly for Vronsky, whom Taylor-Johnson misplays as a preening scalawag who is not dashing nor all that desirable. Moreover, we simply asked to assume the reasons Anna has no love left for her older husband Karenin, well-played with slow-burn restraint by Jude Law. Part of the disconnect is a matter of age: Karenin is 20 years Anna’s senior in Tolstoy’s story while Law is only 12 years older than Knightley. Most of it, however, is a matter of perception. Vronsky does little beyond garble a few sweet nothings to make Anna so blindingly betray her marital and maternal vows. Thus, so much of the 130-minute running time plays out like overcooked melodrama: think Douglas Sirk meets Max Ophüls meets Baz Luhrmann. That makes for good spectacle, but not necessarily compelling cinema.